I don't think the new Eau Claire des Merveilles from Hermès has officially launched yet, but it's on counter at Hermès boutiques and at Nordstrom. Depending on how you count, it's the 3rd or 4th flanker to 2004's Eau des Merveilles, which has already been joined by Parfum des Merveilles and Elixir des Merveilles. Eau Claire des Merveilles, which was developed by Hermès house perfumer Jean-Claude Ellena, is pretty much exactly as it was described in the press materials: delicate, soft and sparkling, with powder notes and vanilla. The start is wonderfully fizzy citrus soda; that softens into a creamy-sweet (but airy) cosmetic powder, lightly vanillic, with just a hint of the salty woody amber from the original Eau des Merveilles underneath — if I did not know it was a flanker to Eau des Merveilles, I doubt I would have thought of it. It's light and summery — much more so than the chocolate-orange Elixir des Merveilles — and wears perfectly in the heat and humidity of an East Coast summer. The original Eau des Merveilles grew on me slowly: I did not care about it either way at first, now it is one of my summer staples. I bought Elixir des Merveilles unsniffed, liked but did not love it, and ended up swapping it away for a bottle of Eau des Merveilles. This week I've been wearing all three fragrances together, and I still like the original Eau des Merveilles the best, but Eau Claire des Merveilles comes in second, and I am liking Elixir des Merveilles better than I used to. Hermès really ought to do a coffret with all three fragrances in 15 ml. 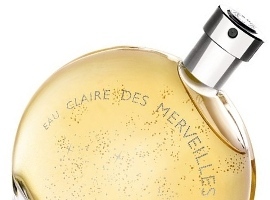 A side note: 1 spray of Eau Claire des Merveilles layered over 2 or 3 sprays of Eau des Merveilles is perfect, so much so that I really am tempted to buy. Hermès Eau Claire des Merveilles is available in 50 and 100 ml Eau de Toilette. The lasting power is about the same as that for Eau des Merveilles. I picked up a sample of this the other day at Nordstrom. I like the top notes: it reminds me of this salt-preserved orange peel I get in Chinatown. They’re deliciously salty. Too bad the base notes run out of cash about 2 hours in and fade to this cheap orange-tinted musk. I liked the dry down better than you did, but do try them layered — it’s much better. I like Eau de Merveilles but found it was to masculine for me to wear. Would you say that the Eau Claire is more feminine than the original? Same here with the original being much to masucline on me. I prefer the original, but sometimes find it a little too cold, or dry, or masculine, or something…I find the Elixir too sweet and foody and feminine…Maybe this one is juuuuuuuuust right?! Same here too, with the original being way too masculine for me. And I have the body lotion too that came as a set. Boo! Try the Eau de M. body lotion (or cream) and spritz the Eau Clair de M over it. Perfect! Makes it last longer, too. No, it doesn’t generally send me running either. Like this one though…it isn’t heavy. None of the earlier iterations have worked for me (yet), but I’ll still give this one a sniff…if for no other reason than that the bottles are awesome. It’s really a wonderful bottle design. Oh, I’m so excited to hear this! Both original Eau des Merveilles and the Elixir have been favorites of mine for years. Eau Claire sounds lovely and I can’t wait to try it. Great to see another just-out-of-the-gate review, Robin. This definitely sounds worth trying as I love Eau des Merveilles, which I need to replenish in my collection. Elixir was nice too; I don’t remember finding it chocolatey, but I’ve only tried my sample once. I’ll confess I’ll always think of the town of Eau Claire, Wisconsin, when I see this flanker name now; they should make it their official perfume. I can’t believe I didn’t notice that; both my parents were born there. M: the only reason I won’t rush to buy this (AFTER sampling) is that at this point, the original is available for “almost nothing,” and unless something blows my socks off, I’m loathe to pay full retail … Plus, the original is close to perfect for me. I do need to replenish though. Or is THAT the one you meant I should split? Hahaha. It’s so true about the price, and this one is not cheap. Oh really? Is this one more expensive than the typical Hermes retail? No, no more! But Hermes is on the upper end of the mainstream price scale. At least it’s a case of you get what you pay for (IMO, anyway). Haha, I was thinking either would be a great split. Love those EdM bottles, but I wish it came in big splash bottles – perfect for splitting! Elixir is only very mildly chocolately, really. Does have a definite cocoa note though. I agree. To my nose, it’s almost like a lighter, camphorous version take on Angel with far less patchouli underneath. Oo, oo, oo, I can’t wait to try this! Ever since I discovered, Robin, that you and I are very close to each on the ST side of the ST/EST spectrum, my interest gets piqued when you like something enough to pondering buying a bottle. I may head out to Hermes this weekend for a sniff…. *whistling*… Thanks for the review! If you don’t like it, try them layered! Will do! Gosh almost everything JCE does these days makes me happy, though. It sounds like it would be safe for me to try this one I was traumatised by of of the Merveilles (guessing it was the Elixir) which smelled so overbearing just sprayed in the air that I never actually dared to apply it on skin. This sounds considerably more civilized and I’m always interested in Hermes offerings. Oh my…I find them all pretty darned light except the Parfum des Merveilles. Hmmmm….interesting…I assumed it wasn’t Parfum because Hermes have me a sample and I figured they wouldn’t have a spray sample of a parfum. It was undoubtedly one of the Merveilles though. That was a couple of years ago now so, perhaps, I should (carefully) try them again at some point. Or maybe just try on skin. I swear, they’re all pretty darned transparent. I’ve got a spray sample of Elixir, and found it overwhelming. Like getting bonked in the head by a big chocolate orange and flailing around for balance. I was afraid of all the Merveilles for quite awhile afterward. Ok, perhaps I am wrong! I find them so light, even Elixir. I love the original and the Elixir, the latter being excellent in sweater, (particularly turtleneck or cowlneck) weather where you find it chilly enough to tuck your face into your sweater and smell your own fabulousness! I will definitely give this a sniff – thanks Robin! Yeah, Elixir could be the winter flanker and Eau Claire the summer. I have to admit I haven’t tried any of these, but chocolate orange has me chomping at the bit (a delicious, chocolate orange-flavored bit), and fizzy soda with powderyness sounds awesome. (Am I the only powder fan? I think I must be.) Just when I was able to control my perfume wants, some new things to try come along. Swell. Bhahahahaha! Miss Kitty you are indeed NOT the only powder laaavah out in cyberspace. I feel you girl. And I feel your pain of more scents coming and the lemming monster rears it’s ugly fat head. And then rests it on my shoulder as I type this. Miss Kitty, Elixir might not be quite as foody as you’d expect if you don’t know the original Merveilles. Do get to know that one first! I don’t normally like gourmands, but the chocolate orange combo is something I’m always a sucker for. I will give them all a sniff and see how I feel. I just re-sampled the Eau a couple of days ago after giving it the general pooh-pooh when I first tried it, and decided that I need to give it a thorough testing (I put it on too close to bedtime, so didn’t get the full effect). It made my nosie perk up quite a bit. I like the Hermes samples – they go a pretty long way. It really did grow on me gradually. I adore it now. I bought mine unsniffed on ebay and quite liked it It’s not my favorite from hermés merveilles line, but it’s prety good. I detect the nod to the merveilles line at the basenotes, after an airy vanilla-flowery orange accord that goes from the opening to the basenotes. The airy vanilla makes me think of meringue. It passes me a soft, velvet summer to autumn impression. Yes, meringue is a good description! Sounds good. I found the Eau de Merveilles too masculine. I haven’t tried the elixir. I do think it’s the most masculine of them all (the original). It seems like there’s a few of us who find Eau de Merveilles too masculine. This new one I have to try though, I love powdery scents! It sounds like something I’d really like,still haven’t sampled the original,been so curious about it. The coffret idea is genius! Hermes should definitely do that. I bought Elixir after discovering that Eau wasn’t the scent my friend sent me a sample of, even though she had thought it was. So Elixir is my one true love, and Eau just doesn’t have the staying power I had hoped for. I need to go back and try Eau Claire again! It is true, the original doesn’t last as long as the Elixir. I think the same is true of Eau Claire…not quite as long lasting. Hi Robin, you have successfully piqued my curiosity now and I am going to order some samples of the already released ones and go off to Nordstroms this weekend to sample the new one. May I please ask you to be a little more specific on the lasting power of this new one in particular? That’s always a deal breaker for me…just want a basis of comparison if possible, thank you. I hate to be too specific because everyone’s skin is different, but I find it needs to be refreshed after 3 or 4 hours (it’s still there, but no longer interesting) whereas Elixir goes at least 6 hours on my skin before it needs to be reapplied. Sorry for the lateness on this but I really appreciate you being specific and for an “eau’ I find that acceptable! I tried it alone today and layered it over the Eau des Merveilles on the other wrist and wow! ~that is amazing! Alone, I was meh on each of them but layered together they are so beautiful without being just “pretty”! I am in trouble now! Thanks for the great info! My next full bottle, I think. I tested it once and loved it. Need to smell it again, but I’m thinking it’s gonna wear lovely in the heat we have here in S. Florida now. I thought it was nice in heat. And powder isn’t always! My mom was born in Eau Claire too! Same is true at my Nordstrom: no Voyage. Don’t know why. tried it once, and the oddest thing was, it smelled like white pepper (the one you use for food) for at least 15 minutes. Toit is not my favorite either, but I’ve really worn Eau Claire quite a bit since I bought it. Nope, missed it — thanks! !